The first Skyship 600 built in Cardington by Airship Industries conducted a series of successful trials with the French Navy in the English Channel. The trials included lowering and recovering a two man Zodiac dingy. The Skyship 600 is the only type of modern airship that can carry out this type of operation, due to the need for downwards thrust which is required to recover the dingy. The vectored thrust system can point up for vertical takeoffs and hovering and down to deal with situations where the airship is statically light. The dingy was suspended by a twin winch system, with a crew entry hatch in the cabin floor. Lowering the Zodiac whilst hovering. Boarding party prepares for pick up. fitted with fly by light controls and a bow thruster. The Sentinel was intended as a half scale version of the Sentinel 5000, however it was destroyed in a hangar fire in 1995. Sentinel 1000 during flight test near Elizabeth City. The owner of ABC had a chance to fly the AT 10 during flight testing and reported that it has the best aerodynamics of any modern airship, with amazing stability, very effective controls and excellent slow speed handling. This new type of airship had side stick controls, air pressure driven actuators and was the first diesel engine powered modern airship, it was designed by Roger Munk, the designer of the Skyship, Sentinel and Skycat series. Unfortunately ATG ran out of funds before full certification was completed and the owner packed the airship up and took it to China, however the AT 10 demonstrated exactly what type of aerodynamic and control system design works best for a small airship and it will be perfect for training, advertising and basic patrol tasks. A new version of the AT10 is now under development by Hybrid Air Vehicles for use as a training airship for the much larger HAV series. The envelope of the Mk 2 version will be slightly larger with 155hp Centurion 2.0 diesel engines. 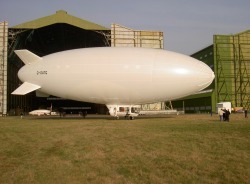 Thanks to Hybrid Air Vehicles in Cardington and Alex for the pictures. See: www.hybridairvehicles.com Pictures remain HAV copyright.